Weddings are featuring large in my life at the moment! We have more weddings booked at St Michael’s this year than I have known in the past five years – and that is really good news. In July, five sets of Banns were called at the same time – something I’ve not experienced before in my ministry. People come to St Michael’s to be married for all sorts of reasons and, with a true sense of hospitality, so far as we can, we try to welcome couples and give them a good experience of church. Many in our congregation, I know, make wedding couples feel welcome and valued as they sit alongside them on Sunday mornings. These encounters are greatly appreciated by many of the couples as they build up ‘connections’ which would not naturally occur if the wedding was taking place in a secular setting – be it in a stately home or on a Caribbean island. Statistics certainly seem to reflect an upsurge in church weddings and when I talk to couples in preparation for their big day I sense, more and more, an understanding that they are inviting God into their relationship and that his blessing on their union is both real and important to them. 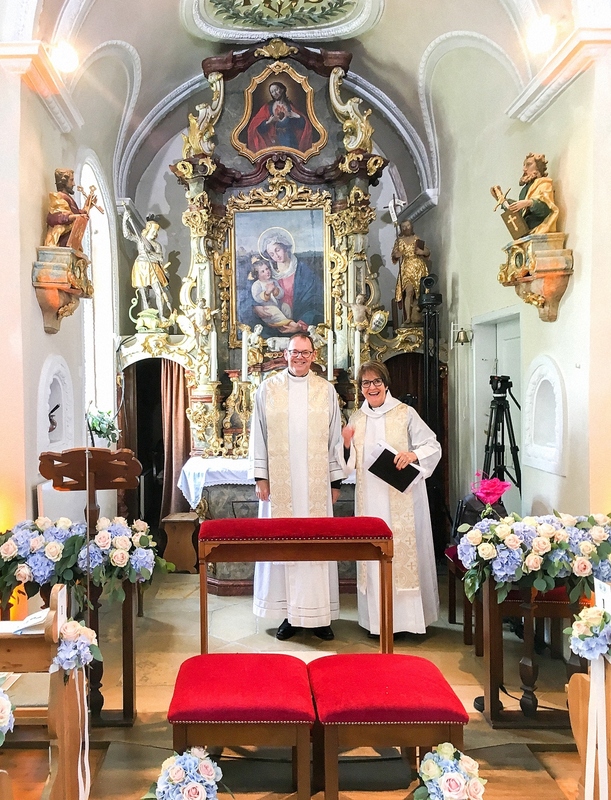 Associations of a different kind resulted in Jane and I being invited to a most beautiful part of Bavaria in mid-July to officiate at the wedding of Lord Max Percy and his fiancée, Princess Nora of Oettingen. This turned out to be a really happy and memorable occasion and a splendid mixture of Bavarian and Northumbrian customs and celebrations. I hope that you can get a flavour of the occasion from the photographs which are included in this month’s edition of ‘Gateway’. In a rather different context, Jane was recently asked to bless a civil marriage in a celebration held on the beach at Bamburgh – and which was followed by a fish & chips lunch in Seahouses! However different the Bavarian and the Bamburgh celebrations might have been, they and all the other weddings that are taking place in our own church this summer, illustrate a growing recognition of the need to have loving relationships transformed into holy relationships in which God dwells with the couples in every aspect of their changing lives and wherever they may go. So perhaps now, as greater numbers return to the church for a blessing on their relationships, is a good time to pray for marriage and family life. They are, after all, the foundations of stable communities. Let us take the opportunity, too, to pray especially for those relationships which find themselves under undue strain or pressure – that love will find a way to renew and re-energise, that ‘commitment’ may be valued and upheld and that gentleness and forgiveness might win the day.